Could it be? Detente? Yes, it appears so. A kind of peace, at the very least, brought upon by the discovery of something unexpected: my wife found an old photograph, and a website she’d not seen before, or wanted to see. Searching for old pictures of our niece for her graduation, my wife stumbled upon this picture taken the same year the girl was born, 18 years ago. It was 1994, and I dressed-up for Halloween. 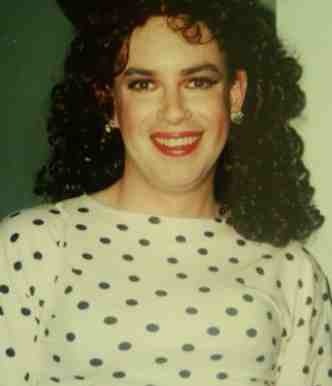 It was the first time since I was a teenager that I wore women’s clothing and makeup. My friends were stunned, especially the young woman I was dating. Someone who didn’t know me commented that it didn’t truly resemble a costume, and asked if I did this all the time. The answer was no, but it was strange to discover after nearly 15 years of male hormones coursing through my body, I could still pass. I never thought about that experience again, until the changes started more than a decade later. It was 2005, and I showed my wife this photograph and others from that party, in a discussion of what was happening to me. Another seven years later, it’s the present: my beloved rediscovered these pictures, not recalling at first that I had showed them to her. There was suspicion at first, and when I answered truthfully and without evasion, she then considered the significance of the timing; she married me just two years after that Halloween party, never knowing about my buried past. It wasn’t something I kept from her as much as I kept it from myself, something to be forgotten along with old girlfriends’ phone numbers and dating disasters. If there was a connection between my modeling days, that party costume and the changes I have experienced, I hadn’t considered it before. But she did now. This discovery, and what she learned from the APA website about transsexualism, truly opened her eyes more than anything I could have said. She realized who I really am. I’m not saying she was no longer broken-hearted, but at least we both felt as though we could go forward as allies, instead of enemies. My wife’s one demand: she considered it imperative that I accepted a fact of life. That instead of seeing myself as a heterosexual male with a transgender condition, she wanted me to “own” that I am in fact a transgender female and a lesbian. No more hiding. I was a little taken aback. I told her I wasn’t ready to move THAT fast! I really have no idea what it’s like to have a totally supportive spouse; I imagined it would take some getting used to. She didn’t have her glasses on, since we were in bed, together. So, as we cuddled next to one another in front of the tiny illuminated screen, I read it aloud, in particular the part about MtF’s who choose to not have surgery so they can stay with their wives and children. There was silence when I finished. A moment passed, and I could sense a relaxation in her tense, naked body, as she lay so close to mine I could feel her breathing. And that’s when she attacked me. Kissed me full-on, right on the lips… and the rest I’ll leave to your imagination. I should note, my transformed body can only do so much without medical assistance, and with a sufficient interval to allow a certain prescription to work. So, don’t jump to conclusions as to what went on, but know this: it was great, for both of us. I think we’re on the road to somewhere. Hopefully, together, for at least awhile longer. And I think I’ll hold-off on that whole idea of “owning” anything and just live in this moment, for now. Is it possible be non-op and authentic? Absolutely. It is where I am at, and the balance point between Janis and me. I can only hope to achieve half of what you two have! Thanks, Brynn! Dawn, I have my date. I will have my surgery on October 1st. For the past year, probably more than that, but certainly while I went through my RLE, facing the inquisition by the psychiatrists at the end of that “trial” period, I can’t think of a single quiet moment when the thoughts of surgery, getting the approval, all the fears and worries about the “what-it’s” didn’t come crowding into my mind. Well, I’ve been through the process. I have all the approvals. I’m just waiting for the final confirmation from Montreal to come through any day now before I book my flight. And I have to say that it doesn’t matter all that much anymore. I have my life. I have my friends. I even still have my family. Yes, I will have my surgery, too, but I totally understand why some people decide to be non-op. It makes perfect sense. I have my peace of mind. I have my “self.” It that were all I could have, I think it would be enough. I wrote a very nice reply to you earlier today, Karen and only noticed just now that it never materialized! So here goes from memory, perhaps not as prosaic but just as heartfelt. First, I am so happy for you. I know that picking the RIGHT date has been a source of tension in your home. As you countdown toward 10/1/12, I wish for you happiness and peace and as little stress as possible. Being in good shape and in good spirits before surgery is paramount. That is the day my youngest was born, so now I’ll have two things to celebrate on the first of October! As for “deciding to be ‘non-op,” that’s a decision for now, at this time in my life, but I am most definitely in the camp of pro-surgery. I for one would not be able to say I feel complete as a woman and not have the surgery. For me, non-op is a choice I must make for myself and my family, that is a precursor to becoming pre-op. My wife and I have discussed this, and I’ve spoken with my doctors, about the long-term plan. I’ve been on HRT one year next month. My doctors and I will see what needs to be adjusted, provided my wife and I can work out some kind of arrangement that causes the least amount of pain, so that I can go full-time and fulfill my RLE requirement of at least one year. Then, and only then, if I can lose 60 pounds and succeed in living full-time, and still feel as though I am on the right course, then my plan is for surgery in summer of 2013, if all the doctors agree. So we take the first step, and plan the next one. For now, non-op is the choice that causes the least amount of unhappiness. Keep in touch with me and I’ll keep you in my thoughts, always. I am SO happy for you. Having an accepting spouse is amazing. I know we will end, but we have the moment, just as you do. Hold it. Nurture it. Keep the channels of communication alive and always open. Whether it is an argument or further revelations, they are all important, even if they sting from time to time. Thanks, Jennifer. One day at a time! Thank you for the musical reminder! I’m hoping for the best. But she’s not changing her mind about our sexual incompatibility if I go forward, or affirm my sexual identity as that of trans lesbian. So there are miles to go before we sleep (with each other) — apologies to Robert Frost.